My Weekly Indicators piece is up at XE.com . Several trends in the US economy have all intensified within the last month. I have a new post up at XE.com . Strong jobs reports like this morning's are inconsistent with any near-term downturn in the US economy. August was revised upward by 17,000. September was revised downward by -5,000, for a net change of +12,000. The more leading numbers in the report tell us about where the economy is likely to be a few months from now. These were mainly positive. the average manufacturing workweek rose +0.1 hours from 41.6 hours to 41.7 hours. This is one of the 10 components of the LEI and so will affect it positively. construction jobs increased.by 31,000. YoY construction jobs are up 233,,000.
manufacturing jobs were unchanged, and are up 80,000 YoY. Professional and business employment (generally higher-paying jobs) increased by 78,000 and are up 664,000 YoY. temporary jobs - a leading indicator for jobs overall increased by 24,500.
the number of people unemployed for 5 weeks or less - a better leading indicator than initial jobless claims - fell by -37,000 from 2,363,000 to 2.326,000. The post-recession low was set 2 months ago at 2,095,000. Overtime rose 0.2 hours from 3.1 hours to 3.3 hours. the index of aggregate hours worked in the economy rose by 0.3% from 103.8 to 104.1. The broad U-6 unemployment rate, that includes discouraged workers fell by 0.2% from 10.0% to 9.8%. the index of aggregate payrolls rose by 0.6% from 124.3 to 125.2.
the alternate jobs number contained in the more volatile household survey increased by 320,000 jobs. This represents an in crease of 1,860,000 jobs YoY vs. 2,814,000 in the establishment survey. G overnment jobs rose by 3,000.
the overall employment to population ratio for all ages 16 and above rose 0.1% from 59.2% to 59.3%, and has risen by 0.1% YoY. The labor force participation rate was unchanged at 62.4% and is down -0.4% YoY (remember, this incl udes droves of retiring Boomers). This was obviously a very strong reoprt, which if duplicated next month strongly implies the Fed will raise rates. There were only a few negatives, including stalled labor force participation, the relatively poor household increase YoY, and the increase inthose who are out of the labor force but want a job. Everything else - the unemployment rate, YoY wage growth, the decline in those working part-time for economic reasons, and even manufacturing hours, was positive to strongly positive. I am particularly heartened by signs that wage growth may finally be improving, in keeping with the thesis that it would do so once the U-6 rate fell under 10%. With nonexistent inflation, it would be nice if the Fed would give labor a break. Last week I showed that, going back 160 years, roughly 3/4 of all US Presidential election results correlated positively with whether or not at the time of the election campaign, the US was in a recession or not. More than 2/3 of the time, it accurately predicted the Electoral College winner, and 80% of the time, it accurately showed the winner of the populat vote. In fact, if we simply go by the metric of whether or not the US was in recession during the 3rd Quarter of the election year, then 84% of the time the winner of the popular vote was from the incumbent party if the economy was expanding, and from the opposition party if the economy was in recession. We now have enough information to make a good forecast as to whether or not the US economy will be in recession in Q3 2016. That means we can make a reasonable forecast as to which party's candidate will win the popular vote. 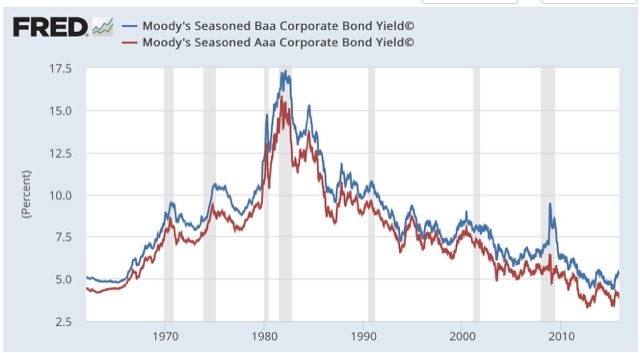 A variation of the above is Paul Kasriel's "foolproof recession indicator," which combines real money supply with the yield curve, i.e., the difference in the interest rate between short and long term treasury bonds. This turns negative a year or more before the next recession about half of the time. 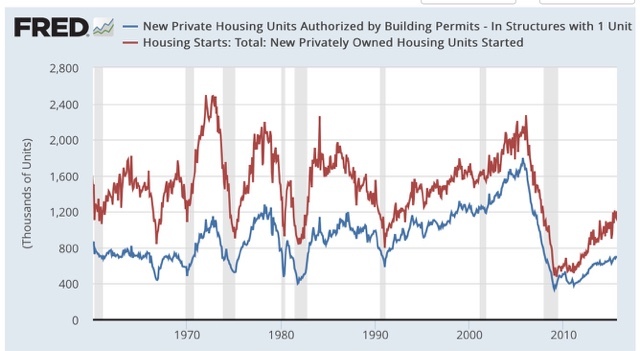 Another long leading indicator has been described by UCLA Prof. Edward E. Leamer who has written that "Housing IS the Business Cycle." 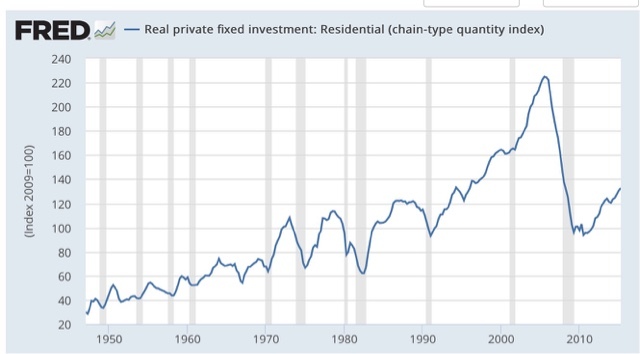 In that article he identified real residential investments as a share of GDP as an indicator that typically turns at least 5 quarters before the onset of a recession. 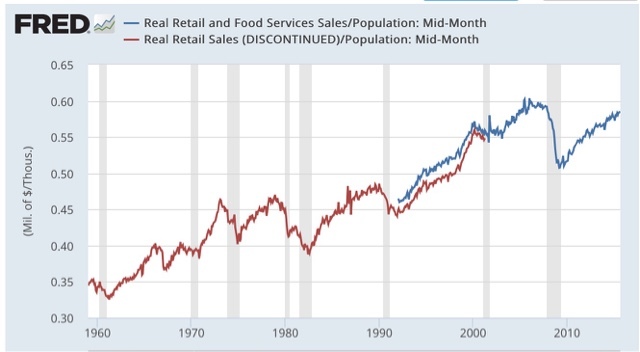 Finally, Doug Short has identified real retail sales per capita as another important metric. This metric tops out at least a year before the onset of a recession about half of the time. This is a negative, but the good news is that frequently a recession has not occurred until 4 years or more after these lows. 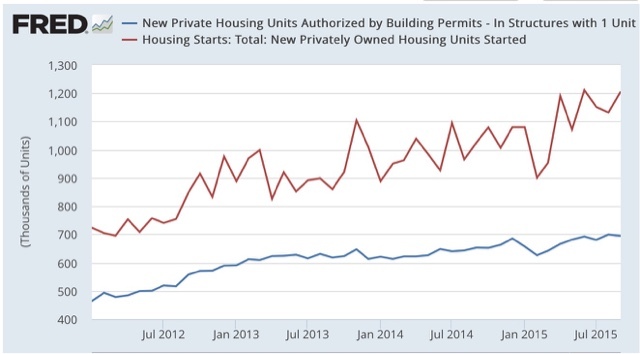 I am not making use of housing permits for mult-unit structures because these were distorted by the expiration of a NYC housing program at the end of June. This caused a rush to get permits for multi-unit structures before then, pulling the number forward and depressing subsequent months. This program did not affect single structure permits, nor did it affect housing starts. In addition to the 1981 "double dip," on only 2 other occasions have these failed to turn neegative at least 1 year before a recession. No recession has ever started without at least one of these two turning negative. Ideally we would like corporate profits and wages to grow at about the same rate. 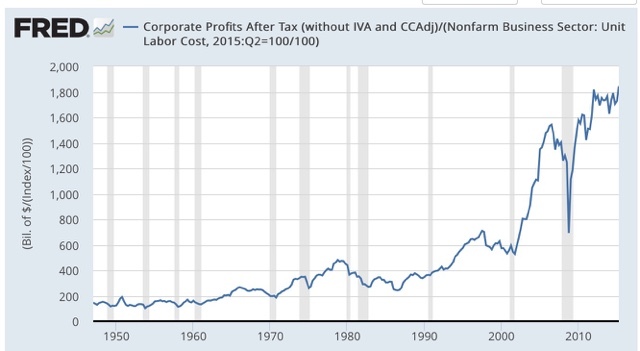 Unfortunately since 2000, corporate profit growth has soared while wages have stagnated. 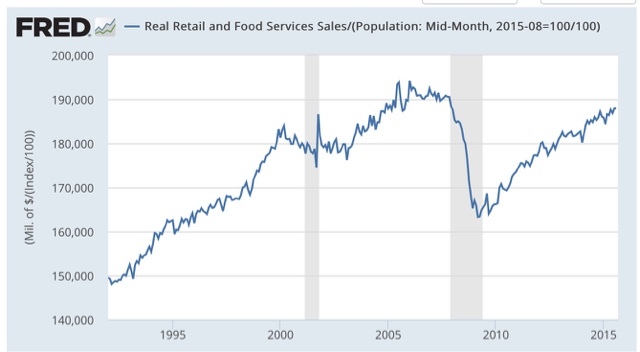 But worse than soaring coporate profits are declining corporate profits: when profits decline businesses stop hiring and if that isn't enough they start laying people off. Corporate profits have peaked at least one year before thennext recession 8 of the last 11 times, one of the misses being the 1981 "double-dip." The best metric for corporate profits for the 3rd Quarter won't be reported until the end of November.. 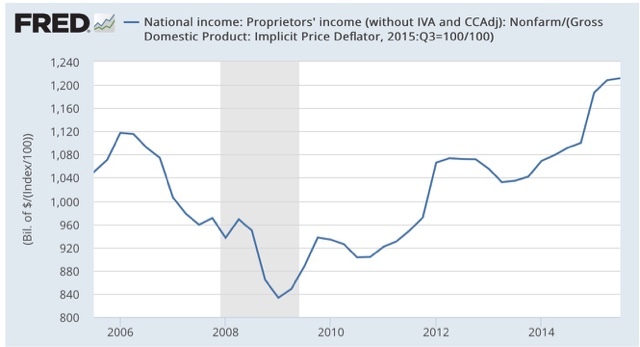 Proprietors' Income, deflated, made a new high in the 3rd Quarter. This is a positive. 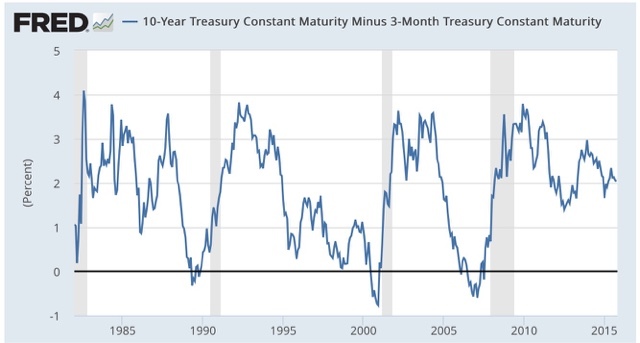 No recession in the last 50 years has started without an inversion in the yield curve (i.e., 3 month Treasuries yielding more interested than 10 year Treasuries). 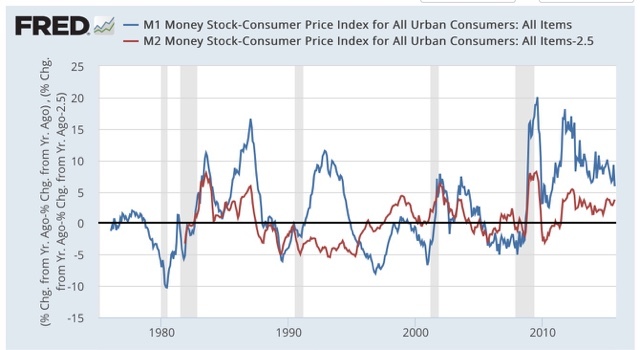 This statement was not true for the period from 1932-1954, so I do not regard this metric as being that helpful, and Paul Kasriel himself has ntoed that the FED's Zero Interest Rate Policy moots this indicator. Nevertheless, it is positive now. 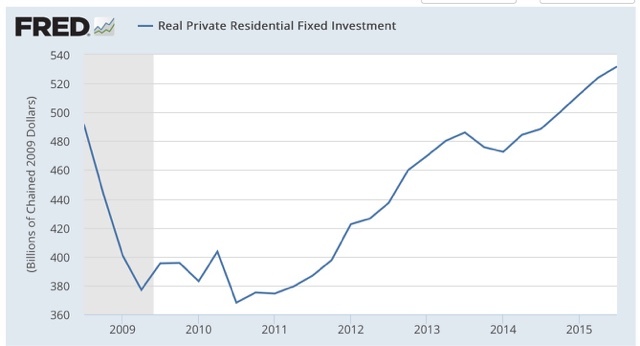 Basically this is spending on private housing as a percentage of GDP. Aside from the 1981 "double-dip," and 1948, it has always peaked at least one year before the next recession: . This basically tells us how much spending is being done for each consumer. Consumers tend to cut back well before the economy as a whole rolls over. It has peaked 1 year or more before the next recession about half of the time. . This made a new post-recession high in the last month. This is a positive. Six of the seven long leading indicators had their most positive readings of this economic expansion in the 3rd Quarter just ended. This gives us a good indication that the economy will not be in recession by the 3rd Quarter of next year. Note that none of the indicators are perfect. None of them forecast the 1981 "double-dip," which was engineered by the Volcker Fed. If the Fed similarly decided to raise rates aggressively in the next 6 - 9 months, or if there were an Oil price spike caused by a Middle eastern War, a recession could happen anyway. This is a very preliminary forecast, but nevertheless based on the 160-year correlation between economic expansions and Presidential election results, if there is no exogenous economic shock, the most likely winner of the 2016 Presidential election will be the Democratic nominee.